Hell Above Earth tells an unforgettable story of two World War II American bomber pilots who forged an unexpected but enduring bond in the flak-filled skies over Nazi Germany. But there's a twist: one of them was related to the head of the Luftwaffe, Reich Marshal Herman Goering, and the other had secret orders from FBI Director J. Edgar Hoover to kill him if anything went wrong during their missions. 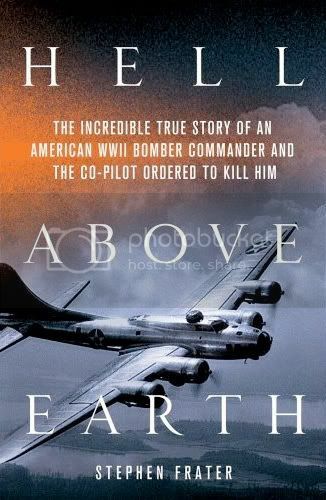 A heart-wrenching Greatest Generation buddy story, an adrenaline-filled account of aerial combat, and a work of popular history, Hell Above Earth centers around the author's discovery of a half-century old secret that has far-reaching and deeply personal repercussions for the pilots, and profound consequences for the FBI and the "Mighty" Eighth Air Force. You can read a large portion of this book here. I went ahead and bought the audio version of this book yesterday, I was going to wait until I finished another book that I'm reading about Stalin, but I couldn't resist after reading all the reviews, besides the Stalin book is a little dry and is better in smaller doses. This book is fascinating and I would bet there will be a movie! I'm half way through it now, most excellent!